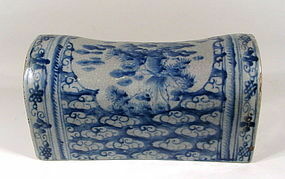 DESCRIPTION: A large Chinese porcelain pillow decorated in underglaze blue with fish and aquatic plants surrounded by clouds. 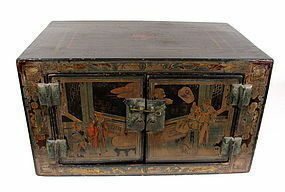 Dating from the 19th C., Qing Dynasty. CONDITION: A few old chips to the rims. DIMENSIONS: SIZE: 10 1/2" long (26.7 cm) x 5 1/2" high (14 cm) x 5" deep (12.8 cm). Chinese Black Lacquer Table Cabinet, 18th C.
DESCRIPTION: An extraordinary Chinese tray, its rectangular form crafted from one slab of huanghuali wood that has been skillfully hollowed to expose the beautiful grain and form the graceful, curved edges. 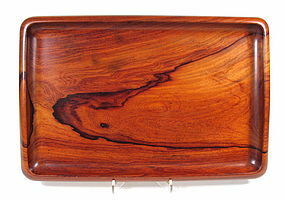 This elegant tray highlights the incredible beauty of this favored Chinese wood and virtually shimmers in the light. 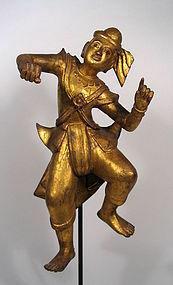 Excellent condition with a nice weight to it; from a private collection. DIMENSIONS: 13 1/2" wide (34.2 cm) x 9" deep (22.8 cm). 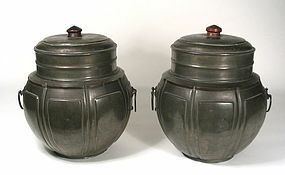 Pair of Large Chinese Pewter Tea Caddies, 19th C.